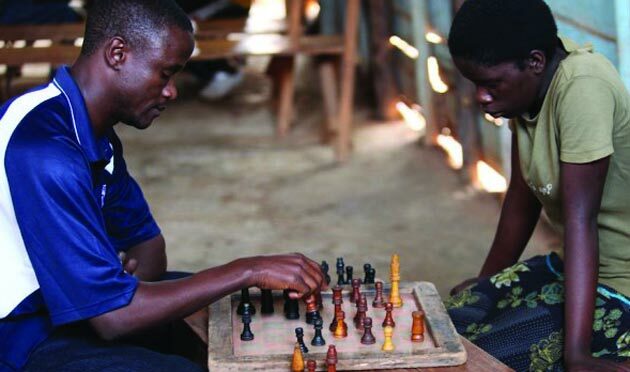 In a chess world where players are obsessed with the exploits of Magnus Carlsen or the latest intricacies of the Sicilian Najdorf stands Phiona Mutesi, a Ugandan player of very humble beginnings and one whom most have never heard of. 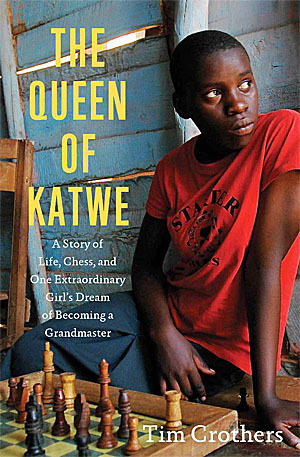 Normally a story like hers would not get any mention in chess media, but Tim Crothers’ The Queen of Katwe is special in its expression of will and determination, yet it like so many other stories expressing a passion within an intriguing pastime. Fiona, later becoming “Phiona” after a technical mistake, found chess if by accident after following her brother out of curiosity. One may say that she found chess, but it would be more accurate to say that chess found her. After chess had claimed another enthusiast, the 9-year old was taken on a fantastic journey that would lead her outside of her tin-roof, ramshackle home all the way to the Chess Olympiad in Khanty-Mansisyk, Russia (Siberia). Other players no doubt had any idea of how difficult this journey was. Katwe, a small slum on the outskirts of Kampala, had it share of hardships and is replete with stories of tragedy and triumph. Robert Katende was one of its triumphs. While it was soccer that saved him, it was chess that would allow him a chance to provide opportunity and vision of hope for so many others. Katende’s fledgling chess program would take on another purpose when he first saw a dirty, unkempt girl enter his club for the first time. “Young girl. Don’t be afraid. You come,” said Katende. Those words would change the life of Phiona. Robert Katende (left) in Katwe, Uganda, with Phiona Mutesi. Photo by David Johnson, Silentimages.org. Phiona had lost her father and an older sister Juliet early in life and and saw her mother work desperately to raise four surviving children. It was a tough battle that her mother Harriet nearly lost as she contemplating whether to end her life. However, she trudged on like many mothers do. Six days a week she leaves her home at 2am to make a five-kilometer walk to meet the farmers who bring their goods into Kampala for purchase, and then she resells those goods for a tiny profit that she hopes will amount to enough money each month to pay rent and feed her children a daily meal of rice. From her relatively plush hotel room in Juba, Phiona returned home to a 10 x 10 foot windowless room, its walls made of crumbling brick with a corrugated tin roof held up by some spindly wood beams and spiderwebs. Drawn across the doorway was a curtain, which must almost always remain open in the oppressive heat of a country dissected by the equator. Laundry hung on wash line that crisscrossed the room. There was nothing on the walls, except where someone had etched some phone numbers in case of emergency. There was no phone. The entire contents of the home were two jugs for water, a wash bin, a kerosene lamp, a tiny charcoal stove made from scrap metal, a teapot, a few plates and cups, one well-worn toothbrush, a tiny shard of a mirror, a Bible and two musty mattresses stacked on top of each other, which were spread out a night to accommodate the four people who regularly slept in the shack: Phiona, Harriet, Brian and Richard. How could someone in such a condition find refuge in a mundane activity when her family lived in abject squalor? In a gripping story accented by countless misfortunes, Phiona over came odds even when death was surrounding her at every turn. In the book she escaped death… even after she was dressed for burial! 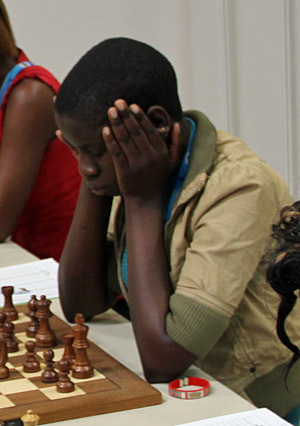 Phiona Mutesi at 2012 Chess Olympiad in Istanbul, Turkey. Photo by Daaim Shabazz. To make it on the Olympiad team and then to have a life-altering experience at Khanty-Mansisyk is what the Olympiad is all about. If one attends an Olympiad tournament and spans the room, each person has a story to tell. Many are national heroes and may have just as much impact in their country as professionals have in theirs… maybe more. While the Olympiad has become a shameful display of elitism with the awarding of individuals medals based on performance ratings (a criteria that favors the playing history of professional players), stories such as Phiona’s are often lost in the glimmer of bright stars. Nevertheless, her story is one that will shine as an example of how chess can change lives of those in even the most dire conditions. The book also recounts how a golden Olympic performance by John Akii-Bua and World Championship gold by Dorcus Inzikuru changed the entire face of sports in Uganda. Phiona has done the same for chess. An Olympiad tournament is designed to celebrate triumphs such as Phiona’s and could give chess a much more universal face. We most often miss these valuable stories while focusing on the top ten players in the world and the latest opening theory. While most chess enthusiasts will not be able to state who won the 2008 Tata Steel tournament or the 2010 Linares SuperGM tournament, Phiona’s story is not easily forgotten and the lessons will last forever. One of the most heart-warming chess stories I’ve read. It is stories like these that remain my motivation to bring human interest stories that either are overlooked or never known. Chess is so much more than a crosstable and studying the latest wrinkles in MegaBase. This story captures what makes chess so special. Chess makes people think. It allows them to solve their life’s struggles… or at least see them from a different perspective. Get this book. I loved the review and your comment, Dr. Shabazz. This book made me cry at several points. I hope chess players will see this as a great gift to their non-chess playing friends or for teen girls who played when they were younger but lost interest. There is so much more to chess than creating the next world champion… it’s about making a champion out of anyone. BTW… I didn’t do an indepth review. I want people to buy the book or e-book! It’s a keeper. Yes sir. So many stories are left untold. This story made me think about my own journey in chess which was none too special. How did we all find chess… and why chess? Why not backgammon? draughts? pool? bowling? Chess has so many qualities and suits people of different personalities and it gives us a chance to build slowly… or “paint” as Kramnik would say. We see what we cannot express in words. More of these stories need to come to light and they may be as intriguing as stories of the greats, at least from a human standpoint. I did a dozen interviews at the Olympiad and my most interesting was two ladies from Fiji, a small country with even a smaller chess community. I missed my chance to do one of WGM Oleiney Linares-Napoles of Cuba. I hope I get my chance in Norway. Your introduction to ” The Queen of katwe ” is fascinating. Makes me want to hurry for a copy. It’s a wonderful book Guy. It is amazing how chess finds people and transforms their lives. Olympiad tournaments are amazing social examples of this. Just received this link to a featurette on Phiona. As you may know, she is touring the U.S. and is promoting her book, “The Queen of Katwe”. Phiona Mutesi wins National Junior Chess Championship from SOI on Vimeo.